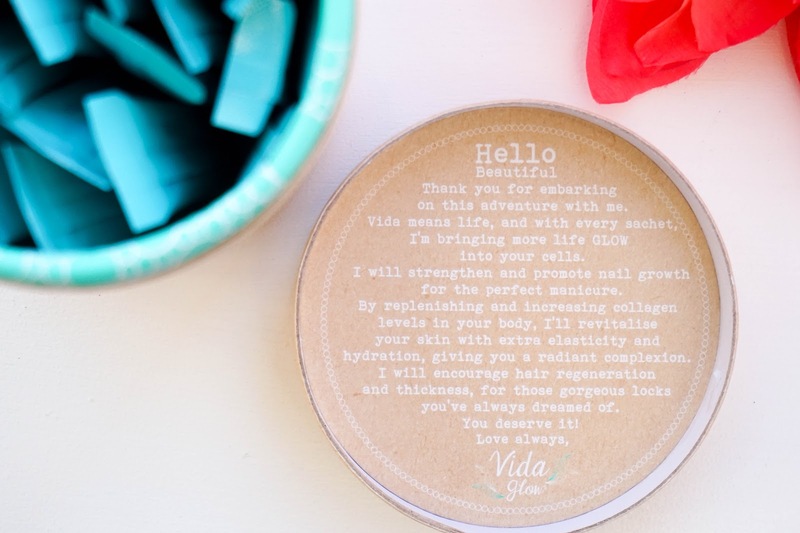 Over a month ago I was contacted by Australian brand Vida Glow to see if I wanted to try out their natural supplements that nourish skin, hair & nails from within. I have to admit I was a little bit apprehensive at first, as I have never tried anything like it, but decided to step out of my comfort zone and give it a try. 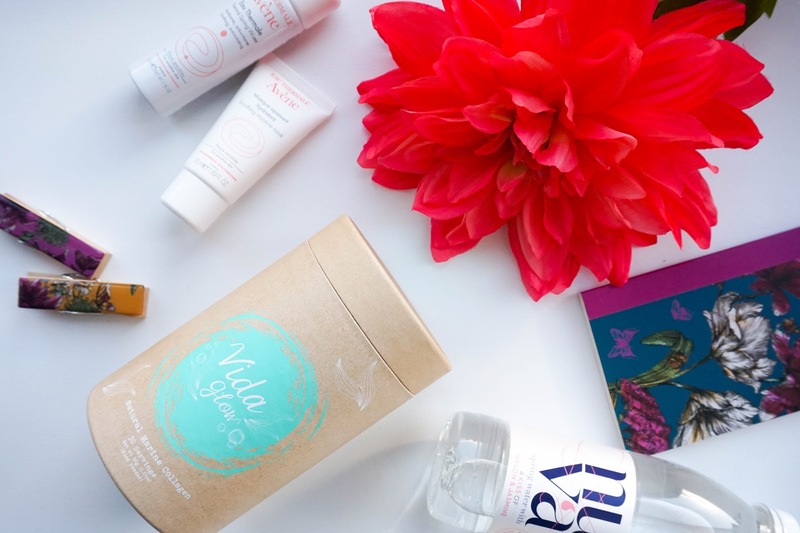 I've been using these particular marine collagen supplements for over three weeks now so I thought it was about time I share my thoughts with you in terms of the results I am seeing. The brand have a varied range of different flavours, but I was sent the original ones with no scent or taste, which I am quite pleased with. The marina collagen within the sachets is pure hydrolysed collagen peptide and it comes in the form of a powder, so it's pretty easy to just mix it in with your favourite drink or food. Now first of all let me tell you a little bit more about the brand and what exactly these marina collagen supplements claim to do. The brand claim that by including these sachets into your daily routine, it will help stimulate your body's natural supply of collagen, which in turn increases elasticity, hydration & firmness to your skin. It also helps to improve the condition of weak & brittle nails, along with adding extra shine, growth & strength to your hair. 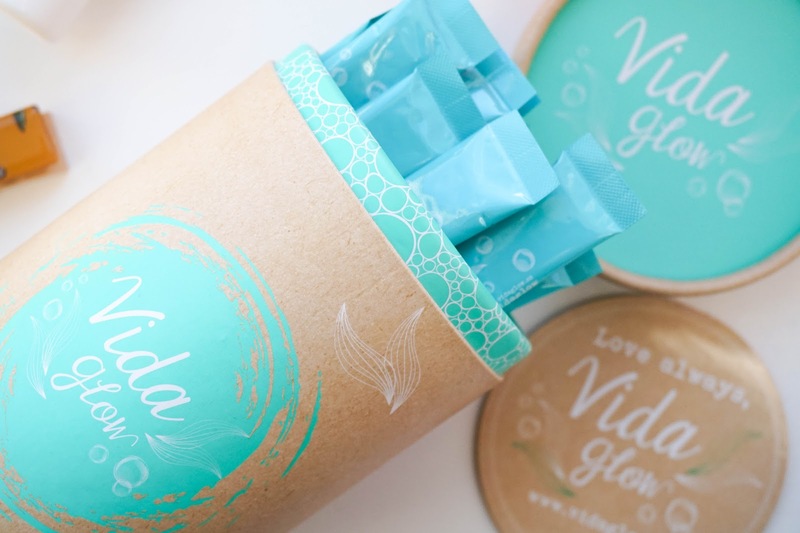 The name of the brand itself Vida means life so their motto of course if 'life glow' which I quite like. 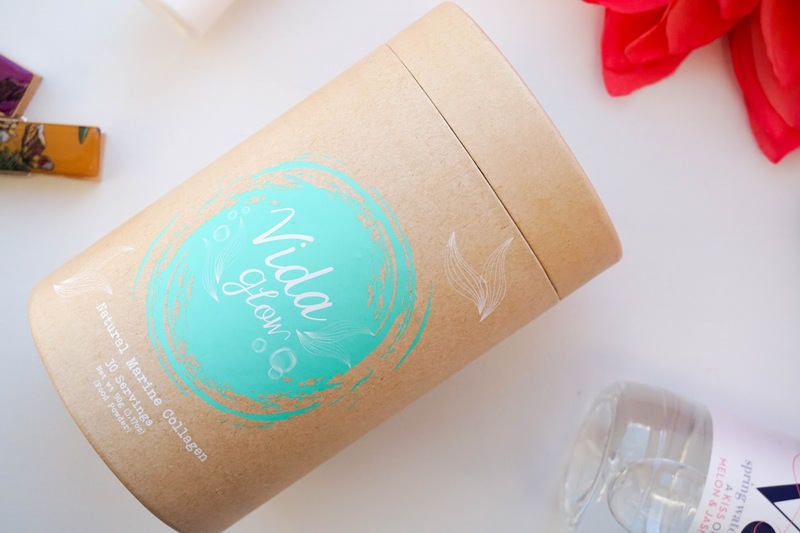 The brand also focus on providing great quality within their product by offering the highest grade of pure marine collagen available and also ensuring that each bath is safely tested by NATA laboratories in Sydney, Australia. So it's recommended to take 1 daily in the mornings, as per instructions it says it can be mixed with your tea/water/juice or even something like your porridge/cereal... Basically whatever suits you best so that's quite handy. The original blend does however claim to have no taste or scent, but this is where I have to disagree. My very first time I mixed it in water and boy did I struggle to knock it back, I can't exactly describe what the flavour/scent is because it's nothing in particular but more like a noticeable powder flavour/scent (am I even making sense here... probably not but it's not easily described). Within a couple of days I learned that mixing it in with my morning smoothie or juice was the best way for me to take it unnoticeably. It's not a deal breaker as such because I know I'm quite fussy with scents/flavours and very new to all of this, but I definitely thought it was worth mentioning. Most importantly after taking a supplement daily for 3 weeks now am I seeing a difference? It's a little bit tricky because I want to say yes, but I'm quite unsure if it's just the supplements working their magic or if it's a combination of the fact that I have been looking after my skin and trying to maintain a healthy lifestyle through eating & exercising regularly. But I'll tell you how I feel at this very moment in time anyway and let you decide... So my skin overall is glowing and looks healthy, fresh, not to mention radiant. I don't suffer with breakouts regularly, but I did notice less pesky spots during that time of the month (thanks mother nature). My hair feels quite healthy despite me bleaching it a few months back, but I have been using masks and nourishing shampoo/conditioners regularly, so I can't say it's just down to the marine collagen supplements. However one thing I have noticed quite a difference with and I certainly haven't changed my routine are my nails. I had a shellac manicure a while back, which made them quite weak and prone to peeling. As of today they look so much healthier, in terms of the fact that they are no longer peeling and feel a lot stronger too... So that is definitely one result I am more than happy & impressed with.